After several years of record breaking fuel prices, many consumers have demanded action from car manufacturers to deliver vehicles that are more fuel efficient. One of the earliest vehicles on the market that became incredibly successful due to its fuel economy is the Toyota Prius. As General Motors saw a big chunk of their market buying Priuses, GM took a bold step and created the Chevy Volt- an all electric vehicle determined to reshape the car industry for the future. The Chevy Volt is a passenger vehicle and similar in appearance to the Prius, however instead of being a hybrid (running both on gas and electricity), the Chevy Volt offers an electric motor powered by Lithium-ion batteries. It should be noted that a small gas engine may be included (making it also a hybrid), but this gas burning engine will only power up the batteries and not run the vehicle directly. 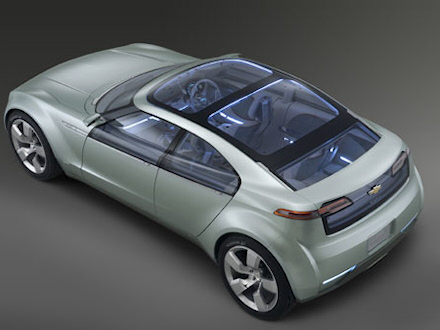 Slated for sale starting as early as Fall 2009 as a 2010 production model, on September 17, 2008 the Chevy Volt was finally unveiled to the press. Fuel economy is unknown until more tests are done, however GM has stated that with a full charge in its current configuration, the vehicle can get about 40 miles to a charge. This is more than most Americans drive in one day and using the small gas engine to charge the batteries, theoretically, you can drive all day long with relatively high fuel economy. As far as price goes, most industry analysts are expecting the vehicle to be anywhere from the low thirty thousand dollar range to the forty thousand or more. However, GM is expecting backing from the US government in the form of tax rebates for consumers which may drive down the price further.